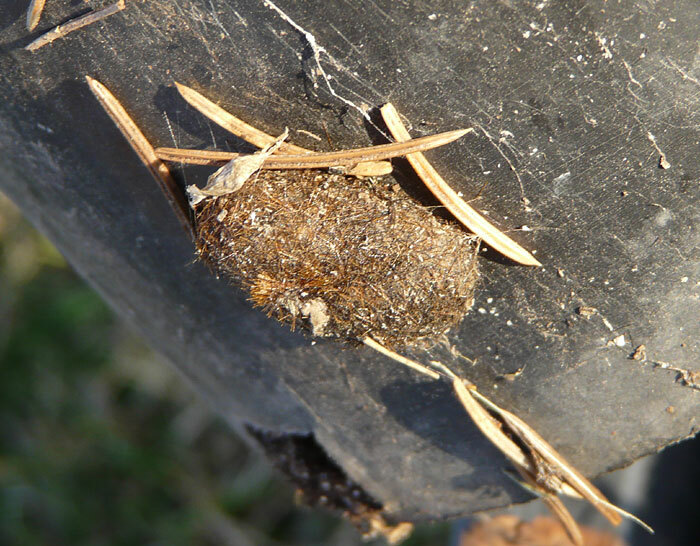 I looked it up and apparently it is a Wooly Bear cocoon! I didn't know what a wooly caterpillar turned into so I looked it up, a isabella moth, and I've seen the isabella tiger moth in the yard! JUST FOUND A WOLLY WORM LAST [oops] last week- usually they are into cocoons by now.. i was surprised! i hope it makes it. we moved it off the road into brush. must be the warm winter? Yeah, this mild winter is definitely making things a bit interesting. I put out all my hummingbird feeders a couple days ago as I already had both of my overwintering Swallowtails emerge. There are no flowers for them to feed at! I figure at least they could go to the hummingbird feeders if they stay in the area. I've seen butterflies go to them before. I think the Swallowtails are really going to be in trouble this year if too many of them emerge before there is a food source or leaves on their host plants for them to lay eggs.